Japanese Episode AG 167: "The 'Red Inazuma' of the Skyscraper!" American Episode 437: "Curbing the Crimson Tide!" In Komoda City, a talking pokemon known as the Akai Inazuma ("Red Lightning") is challenging trainers to battle, beating them, and then disgracing them by marking on their faces. Meanwhile, Satoshi and his friends enter the city, unaware of the existence of such a terrifying pokemon. Haruka splits up from the group to go shopping and is eventually approached by the Red Lightning and is challenged to a battle! The Red Lightning quickly defeats Haruka's Zenigame with a Hyper Beam, causing Haruka to rush her pokemon to the Pokemon Center where Satoshi and the others are waiting. From there, the gang starts searching for the Red Lightning to get it to stop terrorizing the city. They eventually find it and begin to battle, but the Rocket-Dan interrupt with an attempt to capture the Red Lightning. The pokemon makes a run for it, so Satoshi-tachi commandeer the Rocket-Dan's hot air balloon and follow it. They eventually find out that the pokemon is really a Hassamu being controlled by a lonely girl named Luna! Luna's butler reveals that the girl's parents are always out of town on business, so she created a "Red Lightning" persona to keep her entertained. Haruka tells Luna that she knows what it's like to miss her parents and challenges her to a real pokemon battle to show her what it's like to fight fairly. After the match, Luna decides to stop having her Hassamu cause mischief and thanks Haruka for all her help. Luna's butler takes this opportunity to tell Haruka that the next Pokemon Contest is in Aberia Town. With a new goal in mind, Haruka begins her preparations for her next Contest. I don't get this episode. So there's a town where a Hassamu, in a really crappy disguise, runs around and challenges trainers to battle. The trainers accept (because God forbid anyone turn down a battle invitation), get beat, and then have their faces marked on. And yet the pokemon is seen as a menace? I don't get it. The Red Lightning is "bullying" everyone because trainers are too stupid to turn down a battle? I mean...if it was cheating and winning the battles that way, that'd be one thing. But every battle we see the Red Lightning fight was won fairly. I think that Komoda City is just full of a bunch of sore losers. Aside from that, the episode is frustratingly close to being a throwback to Kanto without actually being one. Komoda City looks an awful lot like YoYoYo Town, what with the rooftop mansion and all. That one pigtail girl from that episode even shows up in this one. And to top it all off, the Red Lightning steals Purin's M.O. by writing all over its opponents faces with a marker. There are so many things about this episode that let us know that the writers remember the past, but they don't actually do anything with it. Like I said...frustrating. The dubbed version is pretty normal as far as the dub goes. 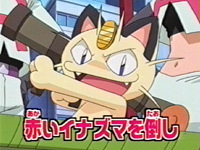 In the Japanese version, Spurt! replaces Battle Frontier as the opening theme. It's my favorite Pocket Monsters song ever and has really great animation that brings back all sorts of nostalgia. It's a shame dub-only people will never get to see / hear it. The ending theme, on the other hand, remains the same. During the battle between Haruka and Luna at the end of the episode, the song Watashi, Makenai ~Haruka no Teema~ plays in the background. At this time, the song just seems like a random vocal song, but later we find out that it's going to become the show's final ending theme. Anyway...in the dub, this song is replaced. The TO BE CONTINUED... screen is made three seconds longer for the dub.